With enough room for three queen size air beds, the Coleman Montana 8-Person Tent lets your whole family enjoy camping trips with extra sleeping space. This camping tent is guaranteed to keep you dry thanks to the WeatherTec system that features patented welded floors with inverted seams. The backpacking tent comes with a rainfly and a covered zipper that help keep water out. An extended door awning creates a dry space to store gear and enter the tent, while the hinged door makes it easy to come and go. The angled windows can be kept open in the rain and help improve air circulation. 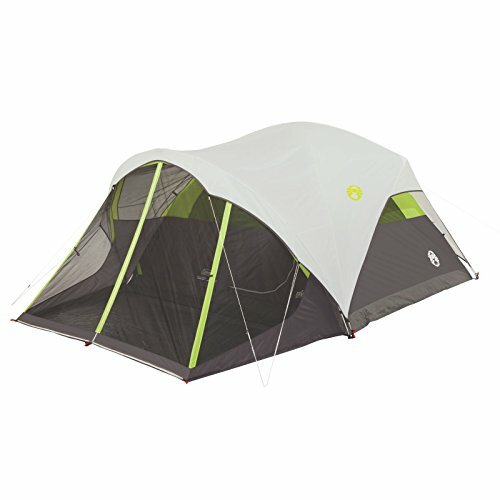 This 8-person tent is designed with a strong frame tested to withstand 35+ mph winds and durable Polyguard fabric that will last season after season. It sets up easily in about 15 minutes thanks to snag-free continuous pole sleeves, a patented pin-and-ring system, and snag-free Insta-Clip suspension. And once your trip is finished, you can pack up the tent in the included carry bag for easy storage and transportation.